Loaded up with 5 different cheeses and lump crab meat, there is no way this dip will be anything but amazing! Melt the butter in a sauté pan. Sauté the minced shallots and garlic or medium heat until just lightly browned, about 5 minutes. Add the fresh lemon juice and sauté 1 minute longer. In a bowl, combine the softened cream cheese, crab meat, Asiago, Parmesan, Francesco Rinaldi Alfredo Sauce, mozzarella, mayonnaise, fresh parsley, and lemon zest. Add the sautéed shallot and garlic mixture. Mix well. Using a sharp knife, cut the top out of the sourdough bread boule so it resembles a large bowl. Scoop out the innards of the bread leaving a thin layer for stability. Save the innards and dice into large chunks for dipping. Dice the pumpernickel bread (or bread of your choice) into large chunks as well for dipping. Set aside. 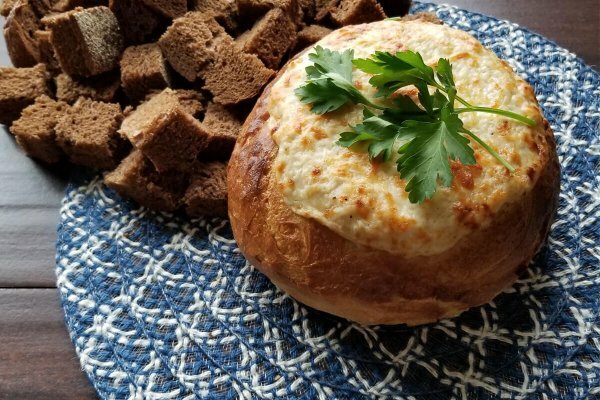 Scoop the crab dip mixture into the bread bowl, packing it down into the sides. Fill it with dip all the way to the top. Preheat oven to 375°F. Crisscross 2 long pieces of foil and place the bread bowl in the center. Pan spray the entire loaf and the top of the dip to prevent sticking. Tightly fold up the foil on all sides to make a pouch. Bake approximately 40 minutes then uncover and sprinkle ¼ cup shredded Asiago on top of the dip. Bake for an additional 10 minutes uncovered, then broil until bubbly and lightly browned. Garnish with parsley and serve on a platter with the diced bread chunks and a serving spoon.